The US has stepped up its air campaign on the Islamic State’s network in Yemen, launching three attacks against the group over the past several days. The strikes took place as the Islamic State has intensified its attacks on Yemeni security forces in the southern city of Aden. The three most recent strikes took place in in Al Bayda province in central Yemen between Nov. 10-12, US Central Command told FDD’s Long War Journal. Five Islamic State fighters were killed in the three strikes: two on Nov. 10, one on Nov. 11, and two more on Nov. 12. The US military launched its first attack against the Islamic State inside Yemen on Oct. 16. The target of that strike was two Islamic State training camps in Al Bayda. The Islamic State was targeted two more times in Al Bayda at the end of October. CENTCOM estimated that more than 60 Islamic State fighters were killed in those three operations. The US military has ramped up operations against both the Islamic State and al Qaeda in the Arabian Peninsula (AQAP). Since the beginning of 2017, the US has launched more than 100 strikes against AQAP and six against the Islamic State, although CENTCOM has not provided the exact number of strikes against AQAP – it will only state that it is more than 100 as of Sept. 14, 2017. The US government has also begun to identify key members of the Islamic State’s network in Yemen. On Oct. 25, the US Department of Treasury noted that Abu Sulayman al-Adani serves as the emir of the Islamic State in Yemen. Nashwan al-Wali al-Yafi’i serves as the group’s top financial official, while Khalid al-Marfadi, Radwan Muhammad Husayn Ali Qanan and Khalid Sa’id Ghabish al-Ubaydi serve as key military leaders. The Islamic State’s network may be eclipsed by al Qaeda in the Arabian Peninsula, but it still is a potent force inside Yemen. While the two groups are rivals and even enemies at times, recent US Treasury Department designations of eight Islamic State and AQAP operatives shows that the two groups often work together. The Islamic State is intensifying its offensive against pro-government security personnel. The Islamic State recently conducted two attacks in Aden, a government-controlled port city in southern Yemen, and the group retains the ability to construct explosive vehicles in or near Aden. On Nov. 5, Islamic State conducted a complex attack against a government security post in Aden. At nine o’clock in the morning, militants detonated a vehicle-borne suicide bomb and stormed a security headquarters in Aden’s Khor Maksar. They gained control of the building’s roof and directed sniper fire towards the security forces inside. Some reports indicated that hostages were taken, whereas others say that the militants released prisons held at the headquarters. The clashes continued until the evening. The attack lasted 11 hours, according to the Islamic State. The group initially claimed 50 casualties, but later revised the number to 69. The longevity of the attack – and the combination of suicide vehicles and small arms fire – indicated an advanced militant organization. On Nov. 14, militants detonated an explosive vehicle at a local security forces camp killing at least six. The camp was located in Aden’s Mansoura district, where Islamic State militants have attacked previously. The Islamic State quickly claimed credit for the attack and referred to the target as the “apostate Security Belt,” what they called the pro-Hadi, UAE-backed force. The Islamic State conducted a similar attack in Aug. 2016, killing at least 54 military recruits in Aden’s Mansoura neighborhood. Islamic State’s Wilayat Aden Abyan has claimed responsibility for both attacks. The Islamic State has also heightened media attention on its operations in Yemen. 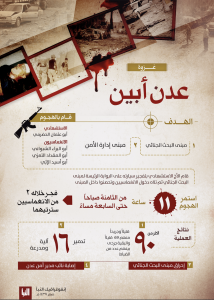 The most recent edition of the Islamic State’s weekly, Arabic-language military update al Naba included a full page infographic on the initial Aden operation. Aden serves as the temporary capital of the Hadi government, as Houthi militant’s control Sana’a. Aden is also one of the few ports re-opened following the Saudi blockade in retribution for the Houthi missile fired at Riyadh on Nov. 4. The Islamic State retains the capacity to construct vehicle bombs in or near Aden, likely in adjacent Lahij City. On Oct. 25, 2017, US Department of the Treasury’s Office of Foreign Assets Control (OFAC) designated Khalid al-Marfadi for fabricating vehicle-borne improvised explosive devices in Lahij City, which is approximately 30 kilometers from Aden.